Takeaway: Bulb, tuber, and root crops may not receive as much attention as vine-ripened tomatoes and fresh aromatic basil, but hydroponic specimens of these versatile crops are surprisingly diverse and well worth planting in your indoor garden. We tend to treat potatoes, onions, carrots, and similar root and tuber crops as cheap commodity vegetables, but they have far more potential than most growers realize. With the increasing globalization of food, root and tuber crops are finding new markets. As usual, hydroponics allows for excellent ways of experimenting with something a little different. Apart from providing super fresh veg for the table, diversifying into subterranean crops offers the opportunity to acquire a few new skills and the anticipation of the bounty to be unearthed at the end of the season. Edible root, tuber, and bulb crops incorporate a wide range of plants, the most familiar being potato, sweet potato, onions, shallots, garlic, carrots, parsnips, radish, turnip, and beets. Also included in this category are several yam species, oca, ulluco, elephant garlic (which is a type of leek), ginger, turmeric, horseradish, salsify, rutabaga, Jerusalem artichoke, and taro. While some of these plants are simply too large for the average indoor garden or have rather specific day length requirements, many others are well-suited to growing in containers and thrive under hydroponic nutrition. The simplest crops to begin with are the baby gourmet versions of carrots, turnips, radish, and beets. Baby root and bulb vegetables grown in this way have a very short shelf life and are thus ideal for pick-and-eat meals that prevent any loss of flavor. 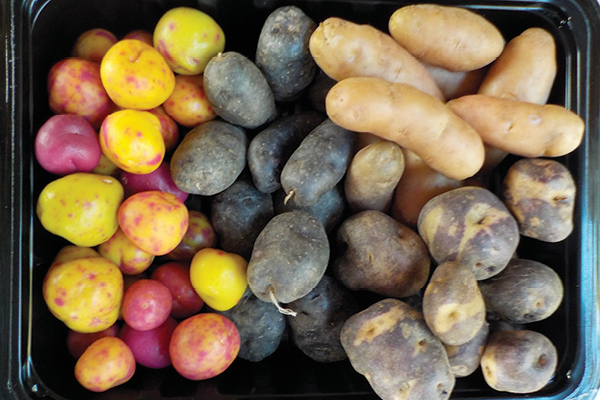 Tuber crops such as potato and sweet potato perform extremely well in hydroponics; however, the most productive use of an indoor garden space is with the more unique varieties. These include heirloom types, which are typically lower yielding than modern commercial varieties but can produce a plentiful yield of gourmet tubers under hydroponic production. Growing purple skinned and fleshed potatoes provides an added antioxidant boost as well as a unique color, which is retained after cooking. Other varieties, particularly older types, offer some great flavor profiles and different textures that are not available commercially. When selecting seed tubers for hydroponics, ideally choose only certified planting stock as these tubers will be disease-free. Note that this may not always be an option with heirloom suppliers, however. Seed tubers can be planted directly into a hydroponic grow bed, but for more reliable results and a quicker time to harvest, tubers are typically “chitted” or pre-sprouted before planting. This involves storing the tubers in a warm place until shoots have started to form from the “eyes” or dormant buds on the surface of the seed potato. Once these are seen, the tubers can be placed on a cardboard tray in the light to let the shoots develop to a length of two or three inches. Seed potatoes with several shoots may be cut to provide two or three new plants (each section must have at least one new shoot). The sprouted potato tubers are then planted into the hydroponic growing substrate with the shoot pointing upwards at a depth of approximately five to six inches. Shoots will emerge from the substrate surface within a week or two and the plant develops new foliage rapidly. Sweet potato, which requires a longer growing season than potatoes, can be sprouted by placing them on a tray with a layer of clean, damp sand or perlite under warm growing conditions. Eventually, the buds on the tubers will form many shoots, each with a few roots at the base. These shoots can be peeled from the tuber and planted out to produce a sweet potato plant. Potato and sweet potato can be grown in large pots, beds, containers, or bato buckets. They can also be planted into potato bags. These flexible bags have a flap in the front wall that can be opened once the plant has reached a suitable stage of development, and young, small potatoes extracted from the root zone without damaging the plant. This allows for a successive harvest of tubers as the plant continues to develop. The removal of small tubers during the growth phase induces the plant to continue forming more potatoes, with a final harvest occurring once the crop tops start to naturally die back. Another option is to grow tubers using aeroponics so the root system can be viewed inside the misting chamber and crops removed when of a sufficient size. Tubers will also grow and produce well in nutrient flow technique systems, provided the dimensions of the channel are sufficiently large enough to accommodate the sizable root system and tubers that will develop. Carrot, parsnip, radish, turnip, and beet all develop a thickened taproot, which is the main edible portion of the plant. While these crops can all be grown to full or even super size in hydroponics, they are more often grown rapidly and harvested as baby gourmet veg. For this purpose, selection of the correct cultivar is vital. Seed suppliers have impressive ranges of varieties to choose from. For example, carrot cultivar Adelaide F1 is a true baby variety that forms a blunt root and matures early and is well-suited to hydroponics. Another option with root crops is to grow usually colored types, such as purple, white, or yellow carrots, black or white radish, rainbow or pink and white striped beet, and golden, cream, or purple turnips. These all add great variety to baby root vegetable mixes and dishes. Growing root crops for harvest at an immature stage doesn’t require an overly deep bed or container system. Seeds are sown directly into the surface (small, difficult-to-handle seeds like carrot can be purchased in pelleted form, which is ideal for hand sowing small areas) and then thinned to the correct spacing after germination has occurred. As an alternative, seed tapes can be used to obtain the correct spacing without the need for thinning. These are paper tapes with seeds imbedded along the length. The paper breaks down as the seedlings develop, leaving plants at the ideal spacing. Quick-to-germinate types such as radish only take a few days to emerge, whereas carrots and parsnips are considerably slower and can take up to three weeks. If growing a range of different root crops, these are best kept in separate containers or rows due to different rates of development. 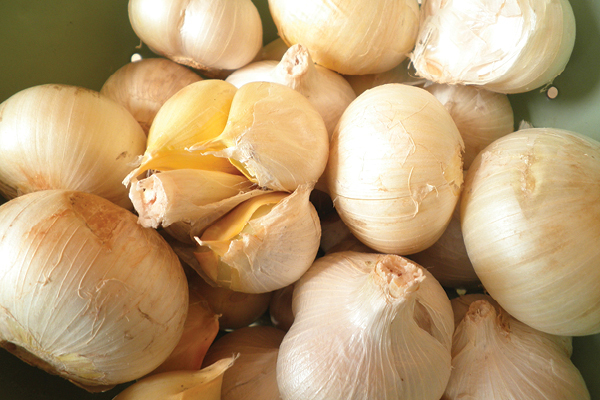 Onions and garlic are the most commonly grown vegetable bulb crops. Even with these plants, diversity exists with color, form, and flavor. In an indoor garden with limited space, growing small cippola-style or cocktail onions such as Barletta or milder-flavored shallots is often a good option. With onions, bulbing is induced by the number of hours of light each day. Long-day onions require 14-16 hours of light, intermediate onion cultivars need 13-15 hours, and short-day cultivars require 12-14 hours. So, selection of the correct cultivar for the number of hours the lights are run per day in an indoor garden is critical for bulb formation. Most seed suppliers provide the information for each cultivar. Onion seeds are slow to germinate; however, these can be planted out as sets, which are young, well-developed plantlets that significantly reduce production time. Within the tuber, bulb, and root crops, there are some lesser-known plants that provide an interesting alternative for hydroponic production. 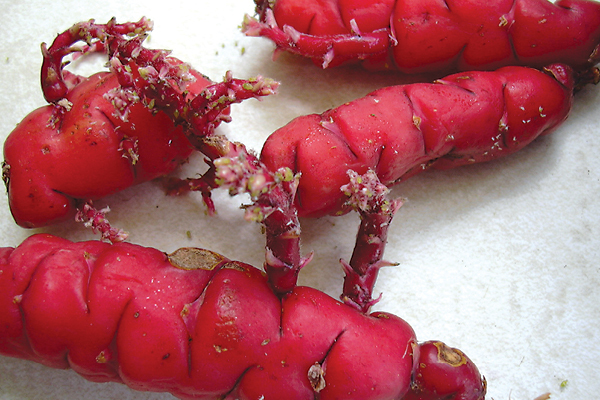 These include ulluco, a small, colorful tuber originating from South America, and oca, one of the many species of yam. Both ulluco and oca are relatively small plants well-suited to hydroponics. They are grown in a similar way to potatoes, with the tubers pre-sprouted under warm conditions, then planted out into a growing bed where vegetative growth occurs rapidly. Both need a long growing season to form tubers. Ulluco has the advantage that its foliage can also be steamed and eaten as a fresh vegetable similar to spinach. Growing root, tuber, and bulb crops hydroponically requires a little more attention to the physical properties of the substrate than many other plants. The rapidly expanding carrot and parsnip tap roots can become deformed if the growing medium contains large, hard particles. For perfectly tapered roots, a finer grade of coconut fiber is ideal. Baby beet, turnip, and bulb onions perform well in combinations of fine-grade vermiculite and granulated coconut fiber, which allow for perfectly rounded specimens to rapidly develop under high-density planting. When growing bulb, tuber, and root crops in deep beds or containers, a layered substrate is often the most successful. This consists of a coarse, free-draining substrate in the bottom third of the growing bed for feeder roots to develop into, with a finer, softer medium in the top two thirds to support the edible portion of the plant. This ensures optimal drainage while maintaining sufficient oxygenation around the roots and a finer surface substrate layer for perfect tuber or bulb formation. Nutrient application for root and tuber crops needs to be evenly distributed. Drip irrigation systems need to be well-designed, with drippers placed at regular intervals and a slow and frequent application rate. This way the nutrient solution thoroughly wets the growing surface, which is vital during the early stages of growth. Aeroponics, with frequent misting of the root system, is another method of nutrient application suited to tuber crops. Nutrients for root crops require a well-balanced formulation. Most general-purpose nutrient concentrates are suitable. EC levels are dependent on the stage of development. For most tuber, root, and bulb crops, these are typically run at 1-1.4 mScm-1 in the early seedling stage and up to 2-2.2 when approaching maturity. Optimal pH levels are 5.8-6.2. Diversifying into a few tuber, root, or bulb crops is an exciting way of extending the range of edibles in an indoor garden. They don’t need to be dull or mundane as there now exists an exciting range of highly colored, unusual, and heirloom types to choose from. Obtaining the right substrate, ensuring uniform application of nutrients, and dialing in the correct growing environment all ensure the success of these subterranean crops.